Seconds from the heart of Gananoque, quality extends beyond the name at the Quality Inn & Suites 1000 Islands. Modern amenities push the Quality Inn & Suites over the top, with each room enjoying 42” plasma televisions, free high-speed Wi-Fi, fridges, microwaves and more. In addition, well-appointed suites also boast an in-room whirlpool, gas fireplace, separate bedroom and two televisions. 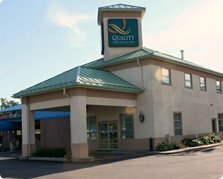 All of this coupled with clean rooms, free parking, laundry service as well as a top-notch customer service attitude, the Quality Inn & Suites 1000 Islands offers a winning combination to guests. After your day, unwind at the Rum Runner Lounge or enjoy an authentic seafood dinner at the Lobster Trap Restaurant conveniently located in the Inn. A niche market in the 1000 Islands, the restaurant means guests don’t have to leave the premises for a sumptuous dinner after a day of travelling or sightseeing.